A detailed guide to health and well-being - providing you with information, articles, and links, including those for Princeton doctors, hospitals, and a listing of health care providers. The latest on traditional and alternative medicines, diet, fitness, mental health, pregnancy and birth. 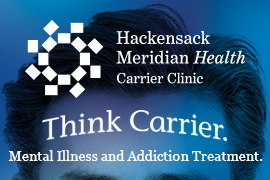 Hackensack Meridian Health Carrier Clinic®, an independent, nonprofit behavioral healthcare system located in Belle Mead, NJ, specializes in psychiatric and addiction treatment. Hackensack Meridian Health Carrier Clinic’s system includes an inpatient psychiatric hospital, a detoxification and rehabilitation center, an adolescent residential facility, and a fully-accredited middle and high school for students classified as emotionally disturbed. Hackensack Meridian Health Carrier Clinic has offered caring solutions and served as a trusted source of help for patients and their families since the doors opened in 1910. It is estimated that, since that time, Hackensack Meridian Health Carrier Clinic has touched the lives of over one million people – including the lives of over 6,700 patients in 2017 alone. The Access Center is open 24 hours a day, 7 days a week and can be reached at 1-800-933-3579. For more information visit CarrierClinic.org. Emotional struggles, stress, depression and anxiety can affect many of us or our family members at various points in our lives. The impact may be felt only within us, or can be caused by or influence behaviors in the workplace, in social and intimate relationships and, for children and young adults, in educational settings. Princeton Family Institute’s highly experienced therapists offer an approach that tailors the treatment to the specifics of each situation. We are clinically trained to work with individuals, couples and families and will collaborate with relevant allied professionals. Mental illness is a family event; we are committed to supporting and drawing on family strengths. Children should not bear the burden of change alone; we always involve families. We are experts who guide and direct treatment, but our approach is collaborative and transparent. We are responsive and available. Please visit our website.